Heat the coconut oil in a pan over medium heat. Sautee the onion and garlic, stirring for 3 minutes. Add the chili paste, ginger and curry powder; stir for 30 seconds and add the vegetables. Season with salt and pepper, and stir. Add the coconut milk, bring to a boil, cover and cook for 15 minutes or less, depending on how cooked you want your vegetables to be. Turn the heat off and sprinkle with almonds and cilantro. Serve with brown rice on the side if desired. Curry powder is made of many spices, but you can still add each spice separately on top of this to add texture (for example, mustard seeds or cardamom pods). You can make this recipe with potatoes instead of sweet potatoes and with cauliflower instead of broccolini. Use any fresh chili or its paste, powder or flakes. Start adding it little by little and try it, so you don't overpower the dish with it and make it uneatable. Morena Escardo During my few meat-eating years as a kid, I had been a big fan of my mother's amazing chicken curry. She rarely made this exotic dish, as Indian cuisine is not very prevalent in South America, and it always felt like a big treat. All the unexpected flavors that came together in that dish were exciting and so enticing that not a single grain of rice or drop of sauce was ever left on my plate. When I moved to college, in England, is when I realized that Indian gastronomy was a vegetarian's dream come true. 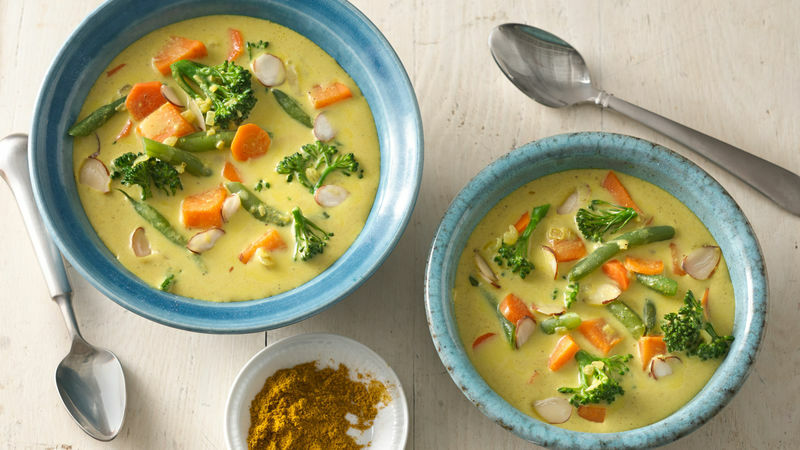 Curries are just one of an endless list of possibilities, and one that I like to make whenever I want a hardy dish that will keep me warm, and where I can put all the seasonal vegetables in my kitchen to good use.